Released 27.11.2006, limited edition of 61 copies in handpainted sleeves, features an insert, sold out. 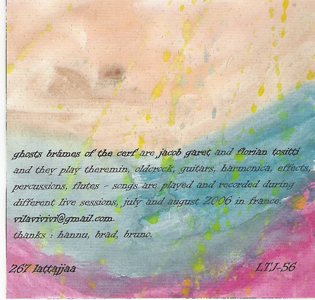 ghosts brâmes of the cerf are jacob garet and florian tositti and they play theremin, oldcrock, guitars, harmonica, effects, percussions, flutes - songs are played and recorded during different live sessions, july and august 2006 in france. 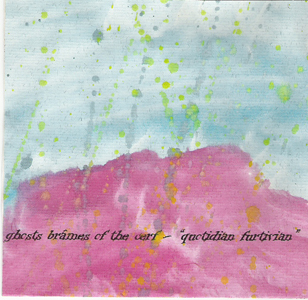 "Ghosts Brâmes of the Cerf is the French duo of Jacob Garet and Florian Tositti (of The Reggaee) and their music often feels like an alienated branch that might have grown apart from the Jewelled Antler Collective. They have already released one 3" cdr on Rural Faune (as Ghosts Brâmes of the Cerf's Magickal, mind you!) and their next full-length is due out soon on Foxglove. From the very first seconds, I was hooked by the atmosphere that the duo is able to conjure up with so little. First, there is a clearly audible hiss which gives the acoustic space a certain density. The sound has a somewhat lo-fi quality as well. Soon, a few percussion instruments enter the picture while remaining in the background; then, some very subtle gong and cymbal work starts to struggle with the soft hissing noise as lower-frequency sounds gradually spin their webs around the listener. That first track "Atonal Compass" gives us the tone. an idea of the colours the duo is going to explore and there is much more to Ghost Brâmes than just a simple nod to Thuja or AMM, for that matter. What I found really striking, for instance, is the sense of freedom that exudes from every sound-gesture made by the duo. Consequently, each element may contribute to the direction of a piece, whether it is a faint, continuous clatter or a fragile loop of whistle-drone. In my opinion, this approach is not unlike the one that has been perfected by Fursaxa over the years. Not only does the music display a highly hypnotic quality, but it is able to find its own form as more and more elements are carefully added/ subtracted to its overall sound. Thus, from the second track onwards (the aptly-named "The Air Is Music"), the duo begins what can be rightfully termed a "minimal" epic as there's an (almost) uninterrupted flow of music until the very end (although some tracks have been distinguished to delimitate specific sections). 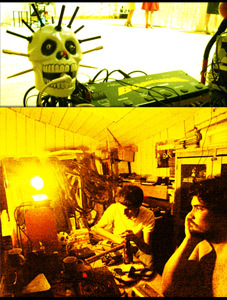 On the third track, the distant whistling rapidly gives way to a delicate duo of electric guitars which complement each other in a very sparse way - while one of them keeps on repeating two notes (which reminded me of the music of Gart & Seekatze), some discreet metallic overtones are meticulously extracted from the other one. As we're getting to the fourth track (there are 7 tracks overall), we realize that a richly-textured drone has been sculpted out before our ears without our having even noticed. This has been made possible through the aforementioned layering of sounds, but a variety of effects has also been applied with great impact to instruments such as the theremin, a harmonica or even a flute. Then, as one of the guitars decides to delineate a new melodic line, this floating, harmonium-like drone is quickly assaulted from all sides by a series of rather abstract noises which become slightly more prominent on tracks 4 and 5. Far from saturating the space with a surge of ascending noise on the overused tension/ release model, the fifth track unravels new (melodic) colours that had previously been hidden from within the fabric of the piece(s). By the time the music starts to fade out (track 6), it has reached such a level of restrained intensity that its dense, yet monolithic nature may make you feel a little dizzy once it actually comes to an end! Like the first introductory piece, the last track is (somewhat) isolated from the rest and seems to try and bring the sounds back to earth (sort of). Here, an elusive melody played on a flute (with reverbs) is accompanied by a soft, yet constant hitting of cymbals and the distant pounding of other percussive instruments. It all ends in a hiss - with the exact same sound that actually opened the cdr. Wow. once the music stops, there is no doubt that you've been taken on one hell of a ride - the performance/gestures being the true guides here and this despite the fact that every section has been carefully laid out to form one continuous whole (the tracks were all recorded during different live sessions in July and August 2006). "Le label CD-R finlandais réputé pour sa constance dans la pertinence de ses choix, accueillait en novembre dernier Ghost Brâmes of the Cerf (Florian Tositti et Jacob Garet). Pour fans avisés de 23 Productions ou du collectif Jewelled Antler (peut-être en plus "lumineux"), ce duo angevin explore couches lo-fi et superpositions improvisées (à base de guitares, theremin, flûte, harmonica, percussions...).